Save over 30% on this great selling, easy to make combination! Start making pens now for the fall show and holiday season. 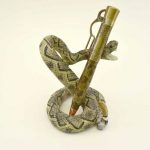 This combination of our best selling Lever Action Pen, Prairie Rattlesnake blank and Snake display stand. NEW-Antique Nickel Lever Action Kits are Here – Almost! Lever Action Bullet Ballpoint Click Pen Kits: In Stock & Price Goes Up Tonight! Lever Action Bullet Ballpoint Pen Kits are here!! Lever Action Bullet Pen Kits Are Back In Stock!